Gazing across the grass and shrubs of Jornada. The land that now encompasses the Jornada Basin Long Term Ecological Research site has been impacted by people for centuries. Native Americans once camped here between the mountain ranges during the summer months, gathering grasses and burning mesquite for fuel. In the 19th century, cattle ranchers moved in from the east, drawn by the same waves of grass. Back then, the meadows, dotted by mesquite and other bushes, dominated the bottom of the basin, where water congregated after rolling downhill from surrounding mountain slopes, or bajada, and wind blew with less force. Where the land angled upwards, a border of tarbush rimmed the grasslands. Creosote grew where it could, but remained concentrated near the arroyos. Settlers brought change. Cattle spread the mesquite seeds with their droppings, while overgrazing and hoof impacts reduced herbaceous vegetation coverage. Scientists at the Jornada LTER hypothesize that the mesquite gradually outcompeted the grasses, creating a transition from the grasslands to shrublands. On the slopes, tarbush replaced grasses first, then in turn were outcompeted by creosote in all but a small rim where tarbush area became grass or mesquite. Then in the 1930’s, people introduced a new species, lovegrass, to attempt to restore the landscape. Instead, the lovegrass began replacing native plants. 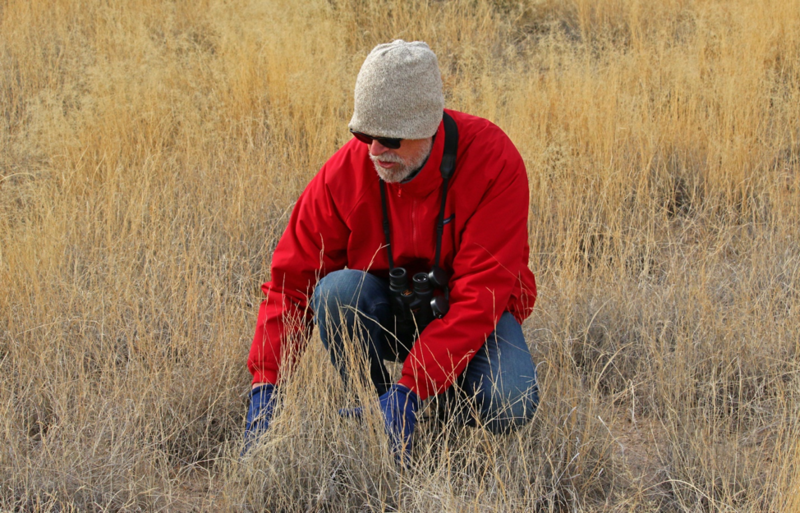 John Anderson examining grass species at the Jornada Basin LTER site. Standing at the base of a mountain, I shielded my eyes against the morning sun to absorb a bird’s eye view of the current state of the basin. A cold front had recently moved through, and I wore Under Armour leggings beneath my jeans and a wind-breaking Gortex jacket over a sweatshirt to guard against temperatures that hovered in the high 30’s. Lovegrass waved around me with feather-like tops, golden in the winter season. Yucca grew tall, leftover stalks and flowers from their blooming season bronzed and shuddering in the breeze. Yuccas look like a creation from the mind of Dr. Seuss, their green stalks holding what were once pale blossoms exploding like fireworks, providing a base for tall, gangly stalks. Purple prickly pear cactus looked menacing from the ground, and mesquite bushes grew here and there, the spikes clearly visible without their growing season leaves. At first glance, it appears as if the sun and shadow have mixed across the landscape. Dark patches met light stretches which are then transformed to deeper shades once more before they meet a belt of gold at the edge of the blue/purple San Andreas mountains, exactly like the dappled look light creates as it dances behind sporadic cloud cover. But no, these alterations in light and dark had been created by a complex mosaic of mesquite intrusion, mixed shrublands, and remaining grasslands, some mixed with the invasive lovegrass, others remaining invasion-free—for now. I stood with John Anderson, the Reserve Manager at the time and Jornada employee since its inception in 1982. The desert may look static, he explained, but this area has undergone rapid transformation. In the 35+ years he has worked here, Anderson has witnessed areas that were once grasses give way to mesquite, and bush area dominated by one species transition to another. 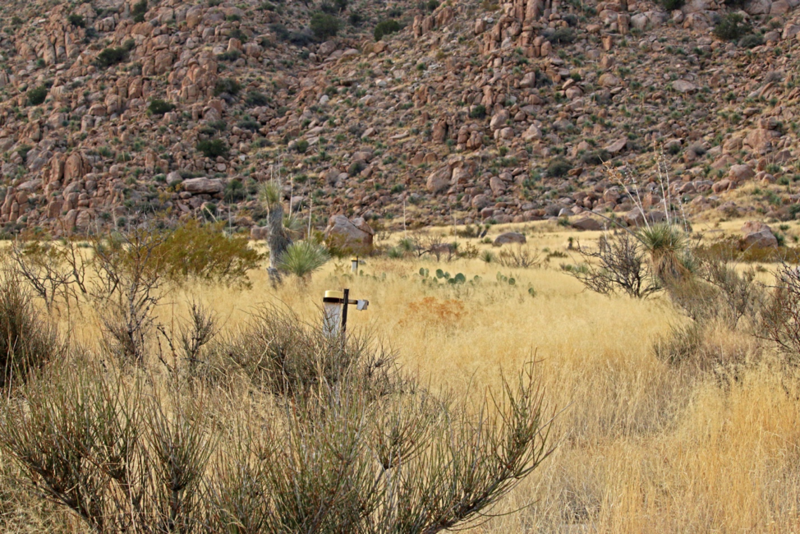 At Jornada, understanding these state changes—from grassland to shrubland, from one type of shrubland to another, and from shrubland back to grasslands—is the central research focus. Anderson picked me up from my hotel in Las Cruces, NM at 8 a.m. In addition to a red coat very similar to mine, he sported a long-sleeve sweater, jeans, hiking boots, and horned-rimmed glasses that turned to sunglasses when he stepped out of the truck. When we began our tour he wore a straw hat, but quickly switched to a knit variety as we faced the brunt of the cold temperatures. He showed me around the site, bumping along dirt roads and stopping both for study plots and wildlife. From stop to stop I quickly became turned around, but Anderson navigated with ease, waving to one of the field technicians as our trucks passed on the dusty road. Jornada was founded in 1982 to study desertification. Once a ranch, the original home still stands, now used as an office at the USDA headquarters. Today, additional meeting space, a garage and machine shop, trailers for students, and a new home for the master mechanic have been added. The USDA parcel, which includes both the Jornada LTER and the Jornada Long Term Agricultural Research Site, stretches 130,000 hectares. 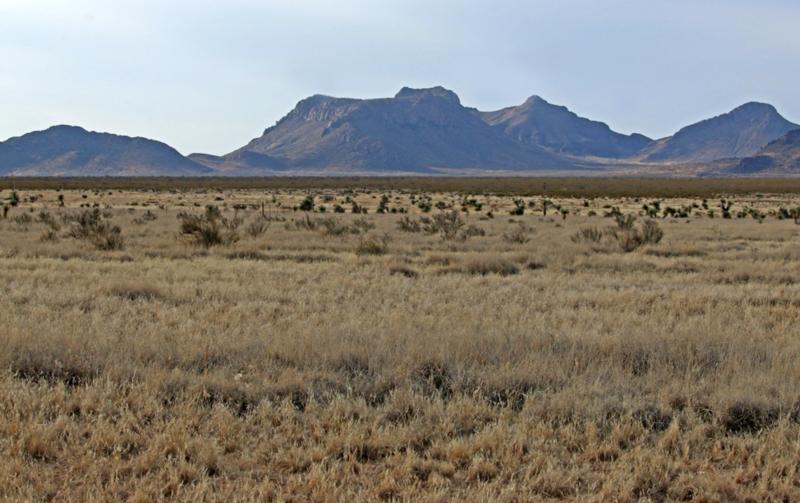 Researchers also share data and study plots with the adjacent 75,000 hectares of the Jornada Experimental Range, and a smaller, public Chihuahuan Desert Nature Park, where students and teachers come to learn about desert ecology. In all, this is a big, overlapping, integrated research operation. The truck crept up the slope of a surrounding mountainside, moving through swinging gates and rumbling over gulleys, etched into the landscape during heavy rains. A low haze had settled across the mountains, muting colors but not their sharp silhouettes. We jumped out beneath a set of buzzing power-lines, Anderson scanning the peak for javelinas and the lowlands for oryx, a species introduced to the region decades earlier. Their grazing and hoofprint influence the grasslands, but they can also wreak havoc on the equipment. A nearby meteorological station sat surrounded by a fence because a curious oryx had originally knocked the whole thing over. Though the LTER initiatives began in 1982, research has been collected at Jornada for far longer. 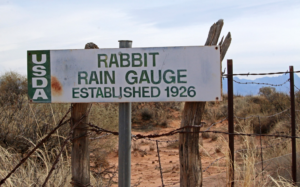 A rain gauge near the USDA headquarters began gathering data in 1915; another Anderson showed me – dubbed “The Rabbit Gauge” – started in 1926. Vegetation plots were set up in 1915 as well, and monitored off and on until present day. In the realm of American long-term monitoring, that is an impressive span extending over a century. If one looked closely, the structures of current and old experiments stood only half obscured by grasses and shrubs, all around us. Farther below we had passed drought plots, where slated coverings intercepted 50% of the precipitation and sloughed it off to one side. In another, low marsh fences had once been used to trap rodents, but now would cause too much disturbance to remove. Separated by 30 meters, markers indicating the LTER transect line had stood for decades. In the early days, many of the area studies centered around this transect line, from insect research to net primary productivity to nitrogen and more, marching up the elevational gradient from the playa below to the bajada where Andersood and I now stood. A vegetation transect marker partially obscured by a growing bush. One of the key goals for Jornada Basin researchers is to determine how over-grazing, climate change, and fire suppression have acted solely or in concert to lead to such dramatic changes in vegetation. They hope to identify some of the key processes limiting grassland recovery so that they may improve restoration strategies into the future.